BusyCal is an award-winning desktop calendar that combines personal productivity features for individuals with powerful calendar sharing capabilities for families and workgroups. 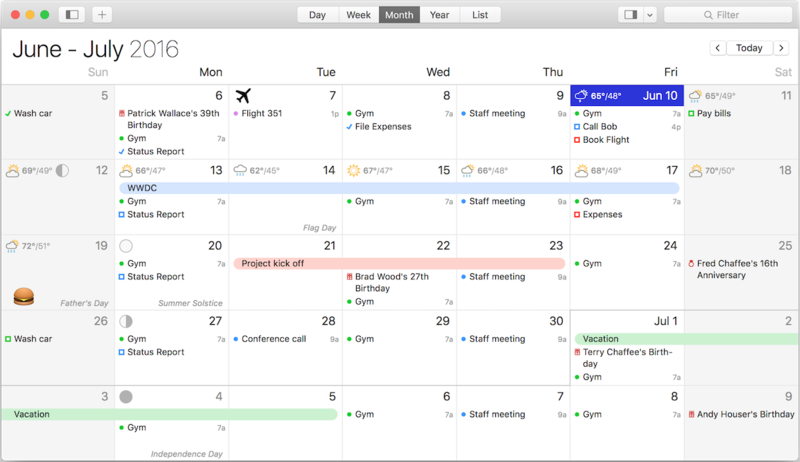 Its unique features include a non-modal Info Panel for easier data entry; To Dos that display in the calendar and auto-forward until completed; repeating To Dos; customizable calendar views including a List view and scrolling Month and Week views; adjustable font styles and sizes, live weather feeds, moon phases, graphics, sticky notes and more. And when you first launch BusyCal, all of your iCal data is instantly imported. BusyCal automatically syncs with iCal, iPhone, iPad, iPod Touch, and other apps and devices that sync with MobileMe or Sync Services. If you later decide to switch back to iCal, all of your calendar data will be current. BusyCal allows families and workgroups to share calendars with MobileMe, Google Calendar, iCal Server, and other CalDAV Servers. You can even share calendars with other BusyCal users on a local area network without the need of a server. And BusyCal syncs with iCal, iPhone, iPad, iPod Touch, and other apps and devices that sync with MobileMe or Sync Services. View and edit event details in a non-modal info panel. Create repeating To Dos that display in the calendar and carry-forward until completed. Scrolling Month and Week Views. Customizable list view lets you filter and sort events by date, calendar, and more. View live weather forecasts, sunrise/sunset times, and moon phases right in your calendar. Customizable event fonts, sizes, styles and colors. Add graphics to your calendar. Add virtual sticky notes to your calendar. Sync with the iPad, iPhone, and iPod Touch via MobileMe, Google Calendar, or iTunes. Sync with MobileMe Calendar and other computers/devices that sync with MobileMe. Sync with Google Calendar and other computers/devices that sync with Google Calendar. Sync with other BusyCal users on a local area network or over the internet. Share calendars with others, with password-protection and SSL encryption. Next story Autodesk Flame 2019.2 – Advanced 3D visual effects software. Previous story GlueMotion 1.2.4 – Create timelapse videos from photos. BusyCal 3.1.7 – Powerful calendar app with multiple syncing options. CalendarPro 2.4 – Google Calendar application. Fantastical 2.4.7 – Create calendar events and reminders using natural language.